RAPHAEL S S SOUZA1, MARCELA C ALMEIDA1, CRISTIANO V MANOEL1, SEBASTIÃO D, SANTOS-FILHO1, ADENILSON S FONSECA1 and MARIO BERNARDO-FILHO1'2. 1 Universidade do Estado do Rio de Janeiro, Instituto de Biologia Roberto Alcantara Gomes, Departamento de Biofísica e Biometria. Av. 28 de Setembro, 87. Rio de Janeiro, RJ. 20551-30, Brasil. 2 Instituto Nacional do Cáncer, Centro de Pesquisa Básica. Praga Cruz Vermelha, 23. Rio de Janeiro, RJ. 2230-130. Brasil. Stannous chloride (SnC12) is used in nuclear medicine as a reducing agent to obtain technetium-99m-radiopharmaceuticals. It have been reported that natural products might reduce the genotoxic and cytotoxic effects related to SnC12. 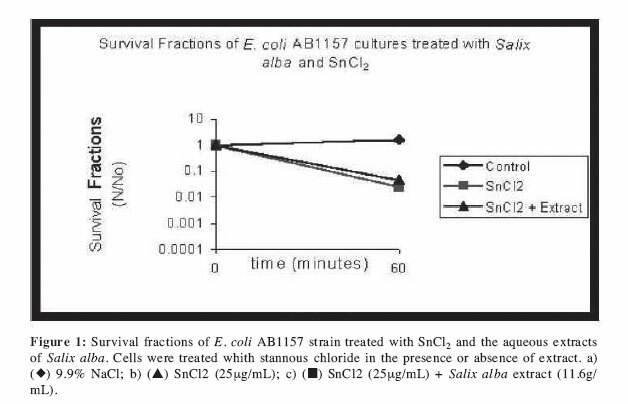 This work evaluated the biological effects of an aqueous extract of Salix alba on the survival of Escherichia coli (E. coli) AB1157 (wild type) cultures submitted to the action of SnC12. E. coli AB1157 cultures (exponential growth phase) were collected by centrifugation, washed and resuspended in 0.9%NaCl. Samples were incubated in water bath shaker with: (a) SnC12 (25mg/ml), (b)Salix alba extract(11.6mg/ml) and (c)SnC12(25mg/ml) + Salix alba extract (11.6mg/ml). Incubation with 0.9% NaCl was also carried out (control). At 60 min intervals, aliquots were withdrawn, diluted, spread onto Petri dishes with solid LB medium and incubated overnight. The colonies formed were counted and the survival fractions calculated. The extract was not able to protect the E. coli cultures against the lesive action of SnC12. The extract also did not interfere with the survival of the cultures. It suggested that the substances present in the Salix alba aqueous extract did not interfere strongly with cellular metabolism and did not alter the survival fractions of E. coli AB 1157. It is speculated that this extract cannot interfere with the generation of free radicals, the possible main agent responsible for SnC12 lesive action. Key terms: Escherichia coli; free radicals; Salix alba; stannous chloride. characteristics (Moro and Basile, 2000). Many of these products are also sold as dietary supplements, even though scientific information about their safe use is hard to find. Limited toxicological data are available on herbal remedies and support of rigorous experimental and clinical studies is lacking (Capasso et al., 2000; Moreno et al., 2004; Fonseca et al., 2005; Li et al., 2006; Wongcome et al., 2007). Salix alba is used for the treatment of fever and flu because it suppresses prostaglandins. The main component of Salix alba is salicylic acid, an analog of the widely used medicine acetil salicylic acid (Smith and Willis, 1971; Fu et al., 1990; Du et al., 2005). Two trials examining the effects of Salix alba (White Willow Bark) found moderate evidence that daily doses standardized to 120 mg or 240 mg salicin were better than placebo for short-term improvements in pain and rescue medication (Nizard et al., 2004; Gagnier et al.,2007). In nuclear medicine, the most widely used reducing agent to obtain technetium-99m(99mTc)-radiopharmaceuticals is SnC12 (Saha, 2006). However, some deleterious effects of this substance have been described. In humans, it has been reported that it is highly irritant to the mucous membrane and skin, although it presents low systemic toxicity. In animals, it can produce stimulation or depression of the central nervous system. As for bacterial assays, SnC12 appears to be capable of inducing and/or producing injuries in deoxyribonucleic acid (DNA), being considered as a potential genotoxic agent. These effects may be, at least in part, attributed to free radicals (FR), generated during SnC12 treatment (Bernardo-Filho et al., 1994; Dantas et al., 1999; Mattos et al., 2000; Assis et al., 2002). Radiopharmaceuticals (radiobiocomplexes) labeled with 99mTc are widely used as imaging agents in single photon emission computed tomography in nuclear medicine examinations (Bernardo-Filho et al., 2005; Saha, 2006). Because the use of the medicinal plants is increasing around the world, and given the limited scientific information about the effect of many of them, we evaluated the effect of the treatment of Escherichia coli (E. coli) AB1157 (wild type) cultures with: (i) SnC12, (ii) an aqueous extract of Salix alba and (iii) an aqueous extract of Salix alba and the SnC12. Stannous chloride was purchased from Sigma Chemical Co., USA. Commercial dried powder of Salix alba was obtained from Orient Mix Phytotherapeuticals of Brazil (Brazil; lot: E4424). Solutions were prepared through addition of 0.9% NaCl (10 ml) to 116 mg of the powder under shaking for 5 minutes. Solutions were centrifuged (1500 rpm, 5 min) and the supernatant phase considered as 116 mg/ml. Samples from E. coli were taken and further incubated under the same conditions up to exponential growth (108 cells/ml). The cells were collected by centrifugation, washed twice in 0.9% NaCl and resuspended in the same solution, as previously reported (Howard-Flanders et al., 1964; Blunden and Wallace, 2003). Samples (1.0 ml) of washed cultures (108 cells/ml) were incubated in water bath shaker at 37 °C with: (i) SnC12 (25 ng/ml), (ii) SnC12 (25 //g/ml) + extract of Salix alba (11.6 mg/ml) and (iii) extract of Salix alba (11.6 mg/ml). A culture of this strain was also incubated with 0.9% NaCl solution (saline). At 60 min interval, aliquots were withdrawn, diluted and spread onto Petri dishes containing solidified LB medium (1.5% agar). Colonies (colony forming unit-CFU) formed after overnight incubation at 37 °C were counted and the survival fractions (SF) were calculated as previously described (Caldeira de Araújo et al., 1996; Dantas et al., 1996). Although Salix alba has been much used in herbal medicine, the number of publications about this natural product on scientific database system as PubMed reached about 39 citations. This fact increases the importance of the findings described in this work. Although several cytotoxic properties have been related to SnC12, humans may be exposed to stannous ions in several situations (Howard-Flanders et al., 1964; De Mattos et al., 2000). 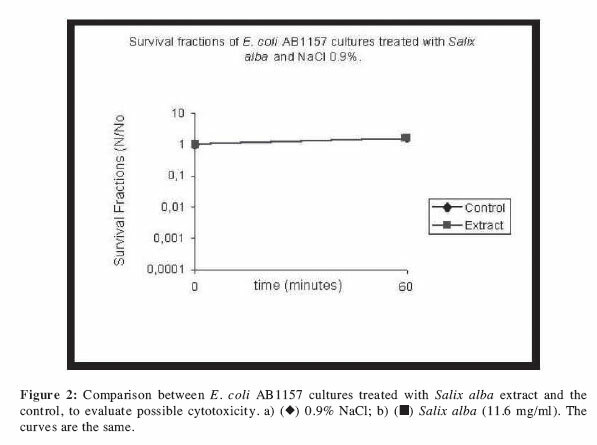 The results in Figure 1 reinforce the fact that SnC12 exerted a lesive action on the survival of the culture of E. coli AB1157 in accordance with what had been previously reported by other authors (Caldeira de Araújo et al.,1996; Dantas et al.,1996; Reiniger et al., 1999; Melo et al., 2001; Bernardo et al., 2002; Soares et al., 2004). Moreover, when treated simultaneously with SnC12 and the aqueous extract of Salix alba, the E. coli cultures were not protected against the effects of the reducing agent. It is suggested that, possibly, this extract could not prevent: (i) the direct action of the stannous ions on the cultures, and/or (ii) the indirect action of SnC12 through the generation of free radicals. These results are in accordance with what has been previously reported in a similar study using rutin (Bernardo et al., 2002). Other authors have reported that some vegetal extracts protect the E. coli strain AB1157 against the damage caused by stannous ions (Reiniger et al., 1999; Melo et al., 2001; Soares et al., 2004). The findings presented in Figure 2 reveal that the studied extract of Salix alba in the concentration did not presented a cytotoxic effect on the metabolism of E. coli AB1157; at least with regard to the capability to interfere with the formation of CFU. These results are highly relevant because publications about the cytotoxicity of the Salix alba are sparse in the literature, at least when searches are performed in PubMed. In conclusion, the findings in this work show that the chemical products present in extracts of Salix alba, in the concentration used, are not toxic to the E. coli AB115 culture. Moreover, the results point to the lesive effect of SnC12 on E. coli culture, and suggest that extracts of Salix alba do not interfere with the generation of free radicals, the possible main agent responsible for the lesive action of SnC12. Experiments are ongoing with other concentrations of Salix alba and various strains of E. coli (BW9091; BH110; AB2494; AB1886; AB2480; AB2463) to continue studies of the cytotoxicity of this medicinal plant. The strains that will be used present specific mutations in genes related to the repair of DNA lesions and will permit the evaluation of a possible genotoxic action of the Salix alba. Supported by CNPq, CAPES and FAPERJ.